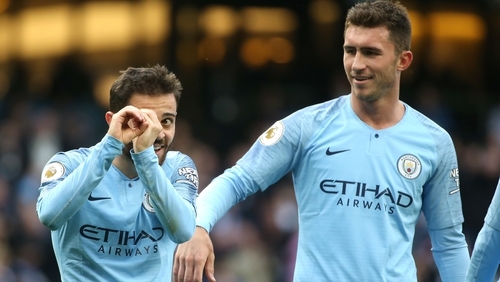 Manchester City turned on the style in the second half to brush aside Burnley 5-0 at the Etihad Stadium and cruise back to the top of the Premier League table. Visiting keeper Joe Hart, making his first return to his former club, pulled off a series of superb early saves to restrict City to Sergio Aguero's 17th-minute opener at the break. But a controversial second from Bernardo Silva, after Burnley's defenders appeared to stop following a foul on Leroy Sane, sealed City's win with Fernandinho adding a third on the hour mark. Pep Guardiola's men wrapped up victory in style with further strikes from Riyad Mahrez and Sane, while there was also the welcome sight of Kevin De Bruyne returning for his first appearance since the first week of the season. Tottenham had keeper Hugo Lloris to thank for three excellent saves from Marko Arnautovic which paved the way for a gutsy 1-0 win over West Ham at the London Stadium. Erik Lamela capped his first Premier League start of the season by heading the only goal of the game in the 44th minute from a pinpoint Moussa Sissoko cross. The Hammers pressed forward to no avail after the break and Manuel Pellegrini's men suffered a further blow when Andriy Yarmolenko was carried off with an apparent Achilles injury. Dismal Newcastle were booed off and slumped to the bottom of the table after losing their fifth straight home game to Brighton at St James's Park. Beram Kayal deflected home what turned out to be the winner in the 29th minute and the Seagulls produced a resolute defensive display as the home side spurned numerous good chances to equalise. Thoughts also turned to Brighton's Glenn Murray, who was carried off the pitch after just nine minutes of the game after a serious head clash, but was later reported to be recovering well in hospital. Cardiff romped to their first win of the season and increased Fulham's woes after a 4-2 triumph in the Welsh capital. Andre Schurrle hit a stunning opener to put the Cottagers in front after just 11 minutes but Neil Warnock's men hit back with two goals in five minutes through Josh Murphy and Bobby Reid. Ryan Sessegnon equalised for the visitors before the break but second-half efforts from Callum Paterson and Kadeem Harris gave Cardiff their welcome first win. Two goals in as many first-half minutes from Etienne Capoue and Roberto Pereyra gave Watford a 2-0 win over Wolves at Molineux, while mis-firing Southampton striker Manolo Gabbiadini missed a late open goal as his side were held to a goalless home draw by Bournemouth. Jose Mourinho was at the centre of a touchline flare-up after Ross Barkley's stoppage-time equaliser denied the former Chelsea boss a morale-boosting win at Stamford Bridge. Anthony Martial's second-half double looked set to seal another success for Manchester United as they hit back from conceding Antonio Rudiger's 21st-minute opener. But Barkley fired home late in added time to grab a point and spark angry scenes, which saw Mourinho dragged away from an incident which also appeared to involve Chelsea assistant Marco Ianni.